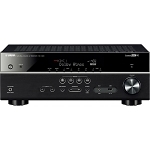 Yamaha's range of AV Receivers are designed to be the hub of your home cinema system, enabling all your source devices, including blu ray players, games consoles, cable and satellite receivers, to be connected to a television or projector for the ultimate viewing experience. The RX-V series of receivers offers unrivaled performance, together with cutting edge features such as MusicCast. The RX-A series are Yamaha's flagship range of Aventage receivers, offering no compromise performance and built with only the highest grade components.